CoreOS is an open source container-optimised operating system, the first in its category. It is designed to allow dynamic scaling and management of computing capacity along with an emphasis on security, consistency, and reliability. This get-started-guide is aimed to help anyone at setting up their first CoreOS cluster and getting familiar with the main systems. You can read a more in detail article on our blog about the rise of CoreOS and its inner workings. Usually, the process of setting up a cluster would start by deploying a number of new hosts and having to connect the cluster manually. With a CoreOS cluster, the majority of the configuration is done even before the first server gets booted up. This works through a script called cloud-config, which defines the required parameters and starts the essential processes during each boot-up sequence. The cloud-config file can be passed onto the server at deployment using our Initialization scripts feature. It allows automating the first-time setup on any Linux host, but more importantly, has it’s own use case with CoreOS servers. Open your UpCloud control panel and go to the Initialization scripts under your account. Click the Add new button at the top of the page. Name the script in the first field and then enter the segments in the script field as shown in the example below. Make sure to include the #cloud-config on the first line so that the system recognises the script. Note that the example contains two placeholders marked with < > angle brackets. These parts will require some attention before you can deploy the cluster and will be explained next. The automated node discovery works through CoreOS hosted discovery service. To start off, you will need to decide the initial size of your CoreOS cluster. Commonly 3 nodes are considered the minimum without any upper limit. The number of nodes is sent to the automated discovery backend when creating a new discovery token. Choose the cluster size by the number of servers you intend to deploy to it. This is important as the etcd2 service will not start until the requirement set by the token is fulfilled, and additional nodes past the cluster size will be assigned as proxies. To generate a new token, open the URL below in your web browser or fetch the token using curl. Use a number at the end of the address according to your intended cluster size. This address will return a very similar URL but with your new discovery token, such as the example underneath. Copy your new token code into the cloud-config script by replacing the <token> with the code at the end of the address. Each node will need to use the same discovery token to be able to join the cluster. You also have the option to include an SSH key to the core default username. This is recommended for security and ease of use. To add your public SSH key, replace the <SSH key> in the cloud-config with your key. You can find out more about SSH keys and how to use them for authentication at another guide. If you do not wish to include an authentication key at this time, you can ignore the ssh_authorized_keys section or delete it altogether. Use passwd core command to set a password to the core username manually after first boot-up. When you are done editing the cloud-config file, save your changes by clicking the Accept button at the bottom. Then go to deploy a new cloud server. Configure the new server as usual. Select the availability zone for your node. Pick a configuration, the smallest is fine. Under the operating system section, use the CoreOS template. Include any SSH keys you may wish add to the root user. Use the initialization script to input a cloud-config file to customise the server at deployment. Choose the cloud-config script you saved earlier, it will appear in the text edit box below. To simplify the deployment process the script allows the use of variables. The $private_ipv4 and $public_ipv4 substitution variables are replaced with the server specific details when the cloudinit file is generated. Once you are done with the server configurations and the cloud-config file is ready to go, hit the Deploy server button at the bottom of the page. The cluster discovery service needs the minimum amount of servers defined by the token (default 3), as etcd2 will not start until the requirement is fulfilled. Any additional nodes past the cluster size will be assigned as proxies. The cluster size can always be changed later using the fleet commands. Repeat the deployment steps until you have enough nodes joined to the cluster. You can check the nodes that have been discovered through your browser using your discovery token URL like the one below. Each joined node will appear in the list similarly to the example at the above link. When you have deployed the nodes for your cluster, continue with the configuration by connecting to each node using SSH. If you added an SSH key to the cloud-config file, you can use it with the core username and the authentication key. CoreOS employs automated update services and as such usually does not require attention except for occasional reboots. However, when deploying a new cluster it is useful to make sure all of the nodes are running the latest version. Run a manual update to ensure your nodes are using the same software. Once the update process is complete, restart the servers to apply the changes. When the nodes are back online again, check that the etcd is working correctly on all servers. See that all of your nodes are reporting healthy results to the cluster, and when they are, you can continue below with docker and fleet tests. If a node is unable to communicate with the cluster through etcd, it is likely the service is not running correctly or at all. Try restarting the etcd2.service with the command below. If you had to restart the etcd, the fleet services will need to be started up as well. You can check the journal entries to further troubleshoot issues, for example with etcd2 using the following command. If you need to make changes to your cloud-config, it can be found at /etc/upcloud_userdata. Any edits to the cloud-config are automatically updated at each boot, but the update can also be run manually with the command below. You can then check that the IP addresses are detected correctly by reading the cloudinit file. If you need to reconfigure the cluster, always use a new discovery token as they are one-time use only. You will also need to delete the old cluster information from the etcd2 data directory. The cluster member information will be generated again when the node joins the cluster. Containers are the main component of CoreOS. The lightweight operating-system-level virtualization method allows applications to be encapsulated and ran in practically any environment. CoreOS ships with the popular container solution, docker, pre-installed and good to go out of the box. To get started with docker, you will need something to test with. Docker Hub hosts a large public container library from which the software can be downloaded and installed with simple commands. Pull the latest version of the busybox image with the command below. Then run the container in the interactive mode with the options as shown below. This will start the busybox container, names it bb1, and leaves it open on the command line. You can then test out the container as you wish. Once you are done, exit the container with either pressing Ctrl+P Ctrl+D or with the usual Linux terminal command below. In this example, the container shuts down after the terminal is close, but does not remove itself automatically. You can see the stopped containers with the following command. Or remove the container when you no longer need it. Running docker manually is simple, yet managing a whole cluster this way would be time-consuming. To avoid having to start each container by hand CoreOS utilises fleet. Continue below to learn how fleet works and how to use it. Fleet is the cluster management interface that controls the individual systemd environments on nodes through unit files. It can be accessed on any of the nodes in the cluster or even remotely using the fleetctl utility tool. The easiest way to use fleetctl is while connected to one of the nodes in your cluster. For example, you can check that all of your nodes are reporting to fleet with the command below. If a node failed to report in, or you got an error retrieving the list of active machines, try restarting the etcd2 and fleet services on the problematic node, or check above in the troubleshooting section for further options. When all of your nodes are listed correctly you can continue with creating your first service. Understanding how Docker works in the earlier example will help with systemd unit files and fleet. In essence, the unit files are a set of instructions of what the container needs to run. To test fleet, create a simple service file and run it on the cluster. Then add the following into the file, save it and exit. while true; do echo Hello World! ; sleep 1; done"
The unit file above defines a busybox container as a service and runs it with a simple Hello World print out script until stopped. Note that if you are familiar with docker and have run docker commands previously, be sure not to copy a docker run command that starts a container in detached mode (-d). Detached mode won’t start the container as a child of the unit’s process id. This will cause the unit to run only for a few seconds and then exit. Load the service with the following command. You can check the service currently loaded or running. Then start the service with the command below. Since this time, the busybox container is running as a service, it will not open in a terminal. Furthermore, the container might not even be running on the same node you are commanding the fleet from, but instead somewhere else on the cluster. Check the node that is hosting the hello.service with the listing command again. To see what the container is doing, use the fleet journal command. Note that on clusters with authentication keys enabled, you will need to allow agent forwarding for the fleet journal and ssh commands to work. On Linux systems use the options -A when connecting through SSH, or with PuTTY SSH client the option can be found under Connections > SSH > Auth. You should see a printout of “Hello World” repeating in the logs. If that is the case the container was configured correctly and started without issues. You can then shut down the process and remove the container. With the test service removed, you are done with this guide. You now have a simple CoreOS cluster ready for more interesting configurations. Deploying a CoreOS cluster is fast and easy with cloud servers. Automated node discovery and simple configuration through the cloud-config file allow you to be up and running in minutes even with larger clusters. Getting to know the basic tools of CoreOS is also effortless and gives anyone the power of scalable distributed computing. 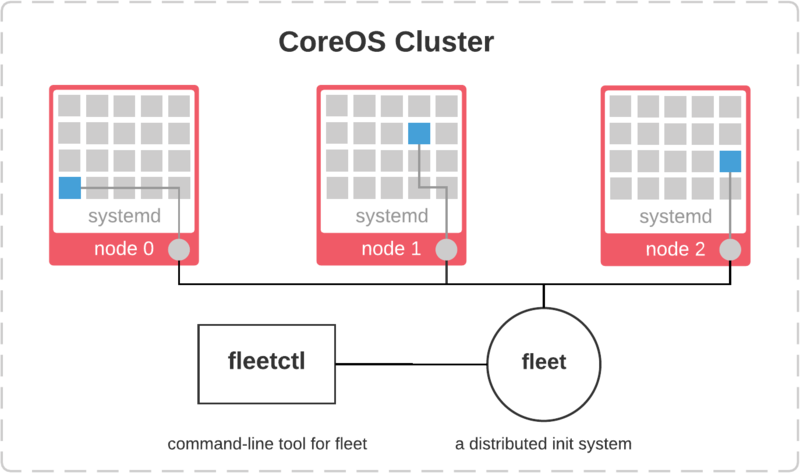 Whether you are planning to develop new containerized applications or looking to utilise some of the many already available container optimised services, CoreOS clusters will allow you to realise your vision. Now that you have gotten started with CoreOS, you might be interested in trying out the cluster with something else. To learn more about distributed computing and high availability hosting, you can continue with our guide for how to deploy CoreOS HA web server.